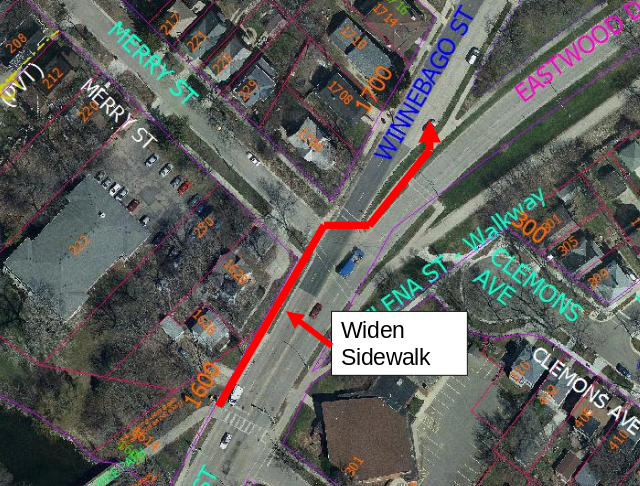 On Wednesday, December 20th, City of Madison Engineering staff presented information on the upcoming Winnebago (Riverside-Merry) project. My previous post on the project is here. A copy of the presentation and staff notes from the meeting are available on the project website. A second public meeting is planned for January or February and the project should be returning to the Pedestrian, Bicycle, Motor Vehicle Commission in a similar timeframe. Construction is currently scheduled to begin in June of 2018. Of the 40+ people in attendance, there was broad interest to improve conditions for people walking, wheeling, and biking in this area. Many noted the challenges in crossing the street and raised concerns about high motor vehicle speed and red light running. There was also a fair amount of interest in reconsidering the Rogers and Thornton intersections as part of this project (including the concept of moving the signal from Rogers to Thornton and tuning the signal timing to align with the signal at Riverside). 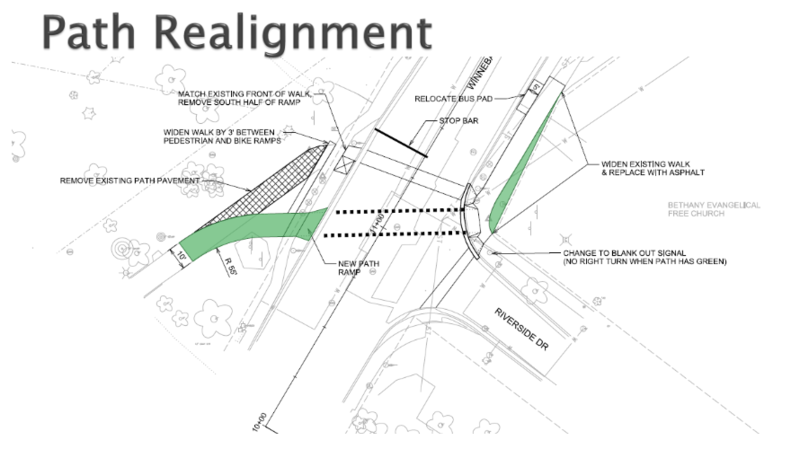 The highlight of the project from staff’s perspective is the proposed diagonal bike crossing. This should be a nice improvement for people on bikes as it will smooth out the sharp turns that currently exist and will provide additional space and separation at this busy crossing for all path users. This proposal seemed to be broadly supported at the meeting and should find its way into the final design. The other item of significant interest for people that move by bike is the missing eastbound connection from this intersection to the eastbound travel lane on Winnebago. I wrote in more detail here about how people on bikes tend to navigate this segment today. It was encouraging to see that Engineering staff had done some initial evaluation of this gap prior to the public meeting and that they included a ‘widened sidewalk’ in the “Other Possible Improvements” section of the presentation. The concept would replace the existing 6’ wide sidewalk with a 10’ wide multi-use path and would require “altering the cross-slope of the roadway and narrowing travel lanes” in order to make it all fit. While there was some concern expressed that better accommodating bicycle travel might lead to increased conflict between people traveling by foot and by bike, most people in attendance seemed to support the concept. As one attendee pointed out, people already bike on this narrow sidewalk all the time, so widening it should result in a benefit for all users. If you have any thoughts or ideas you’d like to share with the city, you can send them to the project engineer, Chris Dawson. We’ll also keep you updated via the Madison Bikes blog. You can sign up here if you’re not already subscribed.